Sometimes it happens overnight. An enemy army descends upon your garden and eats seemingly random plants to the nub. This week, I discovered a host of tiny soldiers with plant-crushing mandibles hard at work stripping the foliage from my clematis. Last week, it was just fine. This week, an army of black and gray made short work of a mature and decidedly tough sweet autumn clematis and I didn't think anything could hurt one of those! They're pretty much a kill-proof, pest-proof plant that withstands just about anything that Mother Nature wants to throw at it. 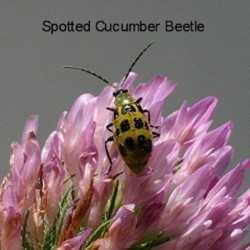 I'm familiar with the striped blister beetles in the vegetable garden. They can lay waste to a carefully tended plot in no time. Tomatoes, peppers, squash, cucumbers and beans are all at risk, but I've never seen the gray beetle that seemed to find my clematis so tasty before. The shape was right, so I figured it was a relative, and a little research came up with the name: Epicauta cinera, the clematis blister beetle. Its close cousin Epicauta pestifera was the one that I was familiar with and except for the difference in markings and preferred food source, they are very similar. While it appears that they travel in packs or swarms, what is actually happening is that these beetles tend to all hatch and mature at about the same time in late summer. They congregate on plants they find appealing and so it does appear that they march as an army of sorts. They leave any plant not on their menu list alone, so it is a bit of a head-scratcher to the gardener who has never encountered this genus. There are a number of species in the Meloidae family that are known as blister beetles. That is because they produce cantharidin, a toxin that produces blisters on the skin wherever the crushed beetle touches. Folk medicine made use of this substance for many years and the crushed beetles were taken internally for ailments such as gout and arthritis, which seems like adding fuel to an already painful fire. However, their most popular medical use is probably the most bizzare. The crushed beetles were rubbed on the skin to cure a male ailment of a more personal kind. This topical medication was known as 'spanish fly', and yes, it was real and yes, men used these crushed beetles as a 'performance enhancing drug', despite of the obvious discomfort to their 'nether regions'. Modern medicine does have its benefits. Blister beetles are also a serious pest to livestock farmers. Beetles caught in hay as it is being baled run the risk of poisoning horses and cattle that consume it. Cantharidin is highly toxic to horses and can also make cattle quite ill, although horses eating the beetle-tainted hay are in the most danger as it takes very little of the substance to prove fatal for them. Alfalfa hay seems to be the most likely the type of hay to have a beetle infestation, (which is also one of the most popular hays for horse fodder) so farmers generally examine their fields closely before cutting to make sure there is no evidence of blister beetles. In areas where multiple cuttings on the same field are possible each season, the spring cutting is usually deemed the safest, with the late summer cutting the most prone to beetle attack. If you harvest hay in a beetle-prone area, monitor your alfalfa regularly to make sure that they don't move in. They can be controlled with SEVEN, and the dead beetles just fall to the ground out of reach of the balers. 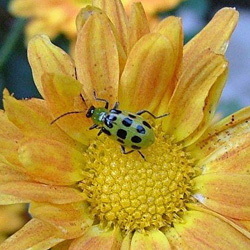 Control of the blister beetles in the home garden is also done with SEVEN, however, my grandmother used to dust the striped blister beetles with flour when they invaded her garden. It was a cheap method that worked. 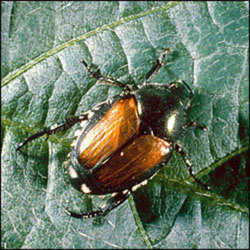 The flour gums up the legs and bodies of the beetles and they fall off the plant and die. It was also an organic method of pest control long before the word 'organic' was used in connection with chemical-free gardening. It was probably also one of the only weapons she had at her disposal in 1940's rural west Kentucky. That's going to be my first method of attack for my clematis blister beetles. My sweet autumn clematis is right in the middle of my garden (and my chocolate mint, that I use daily) so I do not want to use anything that will compromise the good bugs or my health. My neighbor is also a beekeeper and I definitely do not want to do anything that might harm his bees. Their existence is fragile enough these days. At least I now have a name for this new pest and know that they won't do any harm to my other garden plants. My clematis will pull through, I have no doubt, but they have sure worked it over in a very short time. That's why it is important to visit your garden daily and deal with each pest quickly and appropriately.